Right in the center of the northern Italian town of Ferrara is Estense castle, also known as Castle of Saint Michele. Thousands of tourists, however, think this magnificent medieval castle is known simply as Castle of Ferrara. It is named after its owners - Este family. The foundations of the magnificent Estense castle were laid in 1385. It was erected by order of the famous family D'Este who had ruled the city from 1208 to 1598. Castle of Ferrara is an imposing building made up of solid walls, towers, a moat filled with water, gangways and high defenses. It has a square architectural design, dominated by towers at four corners. The observation tower, which is included in the firewall of the ancient city marks the northern edge of the old city of Ferrara, dates from the early 13th century. When in 1264 Obizzo II d'Este was named - Lord of Ferrara, the Este family decided to build the palace just outside the cathedral in the northern part of town. The family of the medieval Ferrara decided to incorporate the structure of its huge castle watchtower, to ensure the protection of Porta dei Leoni and their property. The medieval castle of the Este family was surrounded on all sides by a moat filled with water which was fed by channels from the waters of the Po River. All the towers of the palace were provided with thicker walls and special protective structures, where once lived the artillery of the castle. In these outer parts of the facade of the castle in Ferrara you can see that they are decorated with ornaments that symbolize the two emblems of the power of the family - the eagle and the wheel. The first architect of the castle was, Batolino da Novara, who was an expert in raising the medieval military fortress . Since that time the people of Ferrara often rose in revolt because of the high taxes imposed by the family of Este. It had been necessary to have a solid defensive structure for the castle. Already in the 14th century the castle was called St. Michel. In the second half of the 15th century, castle in Ferrara became the residence of the Marquis at the time of Borso and Ercole I. In the years between 1534 and 1559 Estens became the courthouse during the reign of Ercole II. At that time, it was assumed that the castle of Ferrara underwent reconstruction, which turned it into a castle that we see today. The restoration of the palace was undertaken by architect, Girolamo da Carpi. High terraces were built on the four towers and after the death of the architect the work was completed by Alberto Schiatti. 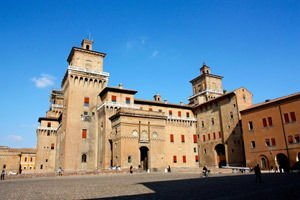 Today the city of Ferrara would not be the same without the imposing figure of the Estense castle as iitself is the main attraction of the Italian city. The beautiful interior decoration and murals were painted by the students of the master Dosso Dossi (1489/90-1542). On the roof of the castle of Ferrara gardens are built, which are also open to visitors.